After a disappointing Bank Holiday the weather improved for a couple of days but it’s back to square one these next few days. For Thursday we see early rain then sunshine and afternoon showers. Highs of 19°C. An area of low pressure is in charge now so Friday will see sunshine and showers with a keen wind. Some showers may merge to give longer spells of rain at times. Highs of 17°C. It’s a slow, improving picture over the weekend. Saturday will be a breezy day with bright spells and showers. Some heavy. Winds easing later. Highs of 18°C. It looks drier as we head into Sunday so apart from the odd shower later on it will be a day of bright spells. Highs of 19°C. 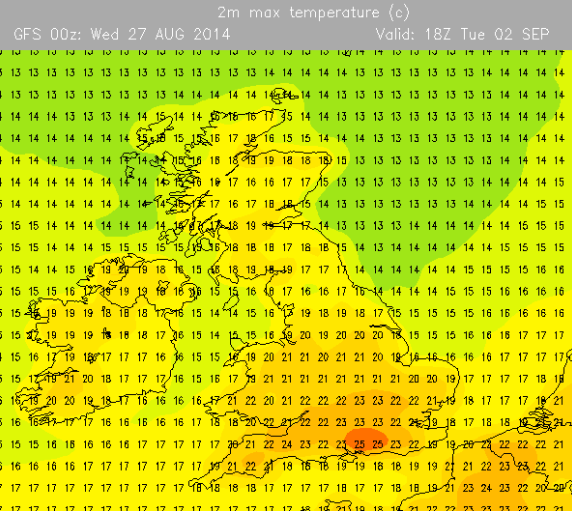 Promising signs next week of plenty of dry weather as high pressure builds. Sunny spells across the region will see temperatures begin to rise so don’t put those BBQs away. Indian Summer? It was a chilly start to the week with northerly winds and the temperatures will stay slightly below average. After a chilly start, Thursday will be bright but thickening cloud from the north will bring isolated showery rain. Some places staying dry. Cool with highs of 15°C. Yesterday’s showers clear to a day of bright spells and occasional afternoon showers on Friday. Still not warm, highs of 16°C. A cold start on Saturday but a promising day with sunny spells and generally dry with an outside chance of an early shower or two. Highs of 16°C. Sunday looks a bright day with sunny spells turning hazy later. Risk of rain into the evening and overnight. Highs of 16°C. Looking ahead for Bank Holiday Monday it looks like the Atlantic will feed us with showery rain from time to time and a little breezy. Highs of 16°C. 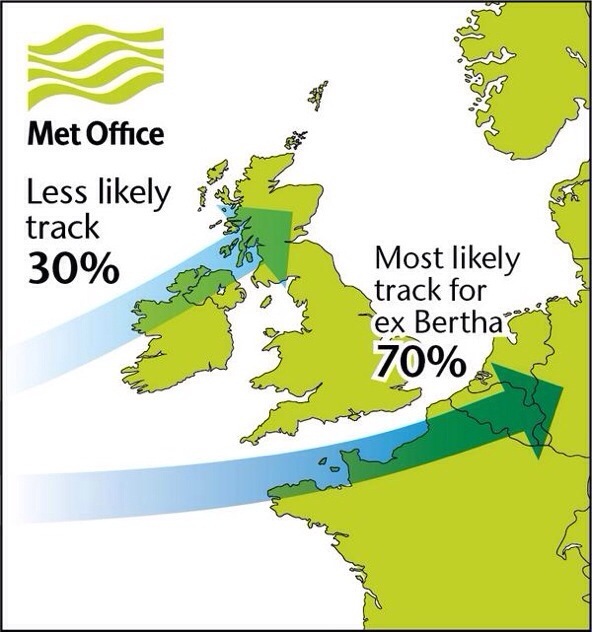 After the remnants of ex-Hurricane Bertha we can expect a couple of calmer days ahead but with rain still in the forecast. With the aforementioned storm still sitting away to our north-east we can expect a cool day on Thursday with a brisk north-westerly wind feeding in showers across the region. Brighter and drier later. Highs of 17°C. Friday we fair a little better with a drier day expected and less windy. Sunny spells and one or two showers well-scattered. Highs of 18°C. The weekend sees Saturday looking the better day of the two. Bright spells during Saturday and most places dry during daylight hours. More cloud into the late-afternoon and with rain expected late evening and overnight. Highs of 18°C. Sunday early rain clears to sunshine and showers. Some heavy and frequent in places. A little breezy again. Cooler with highs of 16°C. Looking ahead still no sign of a heatwave or any very warm weather returning as it remains cool for August with frequent showers.